Look like a pro, act like a pro, Klok-it like a pro. Klok-it is a 2-piece bracket that secures from the back all the way through the door of your outdoor controller. This replaces the existing, or broken lock tab with stainless steel and tamper proof security. Klok-it not only repairs damaged boxes, our through door design allows for an additional secondary locking mechanism. This makes the generic cam-lock keys, which are available to anyone, doubly secure and impervious to anyone but the most determined criminal intentions. Klok-it can be installed in minutes on existing clocks while still attached in their permanent positions. So remember, KLOK-IT Fits most boxes produced with a cam lock. Easy 10 minute installation with the Klok-it Tool. Allows for secondary lock and Made of Stainless Steel. Design it, build it, perfect it, then, make sure you Klok-it! 2. What makes the product innovative. A consistent battle in the landscape Maintenance industry for many years is due to the commonality and the availability of keys for all of the outdoor controllers. While more times than not, the tampering of a controller is done by a well-meaning home owner or tenant, the fault lands firmly on the head of the contractor. When you add the increasing prevalence of theft and sabotage, the liability and costs incurred by contractors on an annual basis is exorbitant, and a damaged reputation can compound those losses into the future. 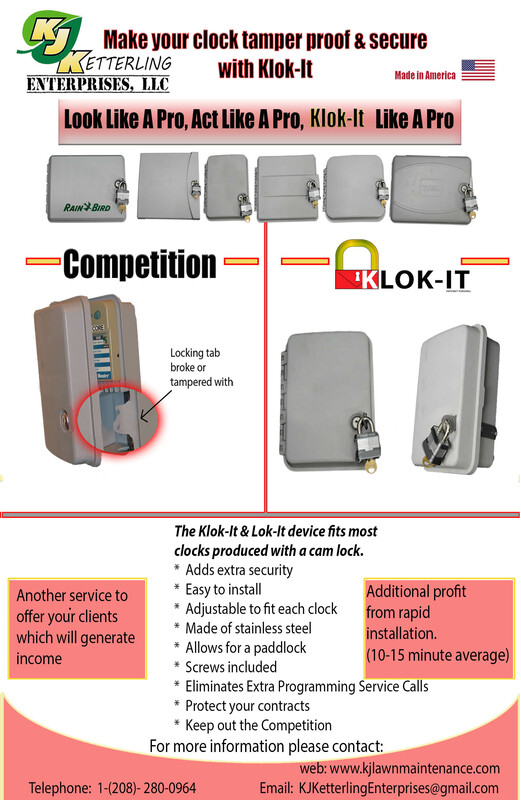 Klok-it is a simple inexpensive solution limiting access to outdoor controllers to the professional. A simple stainless bracket that is able to repair damaged or broken lock tabs without having to replace the enclosure. The bracket is extended through the door allowing for a secondary lock providing the ultimate in protection from anything but total destruction of the controller its self. With installation taking less than 10 minutes, and a multiple use installation tool, the Klok-it is able to solve a plethora of issues faced by our industry cheaply, efficiently, and permanently. The sleek installation maintains the professional appearance of a well maintained subdivision or multifamily complex. 3 How does your product improve water/resource use efficiency? The primary perception from the uneducated observer whenever a brown patch is spotted in any landscaped area, “It must not be getting enough water”. While it is one of the possible issues at any time, it is almost never a system wide problem. The most often solution is taking the matter into the hands of the untrained, uneducated and uninformed by jimmying the clock open and turning up the run times, wasting water, washing away nutrients, and over watering sensitive landscape. The Klok-it denies access to anyone but the authorized, knowledgeable professional. The end user -both the contractor and the homeowner -will use the Klok-it tool and any rotary cutter, to cut the slot into the clock cover. Then slip the bracket into place and put the arm with tab through the cut and lock the clock with either the key to turn tab into the Klok-it bracket. With the addition of a self-locking nut and bolt, the original cam lock becomes tamper proof. 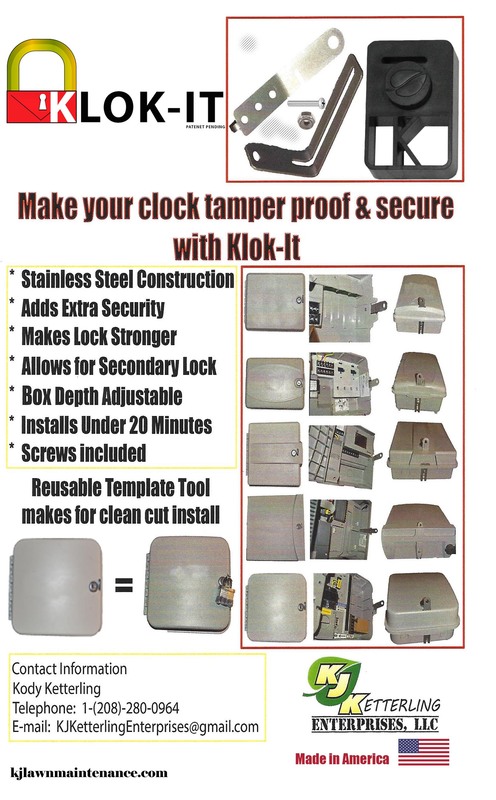 Add a padlock to add extra security to the clock giving only the contractor or homeowner access. The stainless steel bracket once in place provides a new tab that cannot be broken or pushed back to open the clock. 5. What is your product's life expectancy/warranty? Life expectancy of the Klok-it is 20+ years. Being made of stainless steel, and having no moving parts, the Klok-it will outlast any plastic controller enclosure. 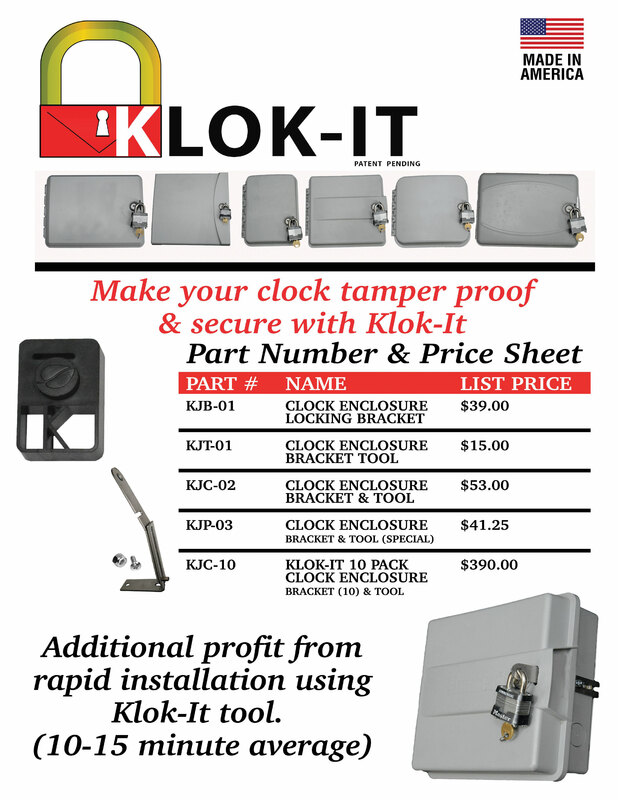 Klok-It has a Limited Lifetime Warranty Against Manufacturer Defects.